Styled with luc sweater and rosemarie pant . See this in Plaid, Pinstriped, Wool Blend or Alpaca-Wool. Taking its cues from menswear tailoring, the Stedman is cut from a warm, double-faced wool-cashmere blend sourced from a fine Italian mill. The silhouette is specially constructed to showcase the fabric's fluid drape. Fits way too big and I already took off the tags so not happy about being stuck with a $250 jacket! Absolutely love this coat but I need to go in and get the security tag removed. Not a big deal but haven't found the time yet! Instantly makes you look fashionable, put-together, and gives you a tall frame. Love this coat! Very classy and comfortable coat. Very happy with it. i wear it w sneakers, i can wear them w boots. it’s versatile and always makes me feel put together. I love this coat! It is gorgeous, his quality wool, and the color is true to the picture (I have the Constant Camel color). It does have an oversized fit, so definitely order a size down. I ordered the XXS and am still going to have to get the sleeves shortened. The one thing I am very disappointed about is that it is very thin. I ordered this hoping it would be great for the winter, but it definitely is not. It's warm enough for like mid-50s, but not any colder than that. I have the original version of the stedman wool coat so decided to get the cashmere blend. I like that it’s softer to the touch, however I noticed that the sleeves were longer on me than the original stedman I had. It almost reached my finger tips so I had to pay to get it shortened which was a little disappointing because I had to spend an extra $50. Quality assurance should be improved. 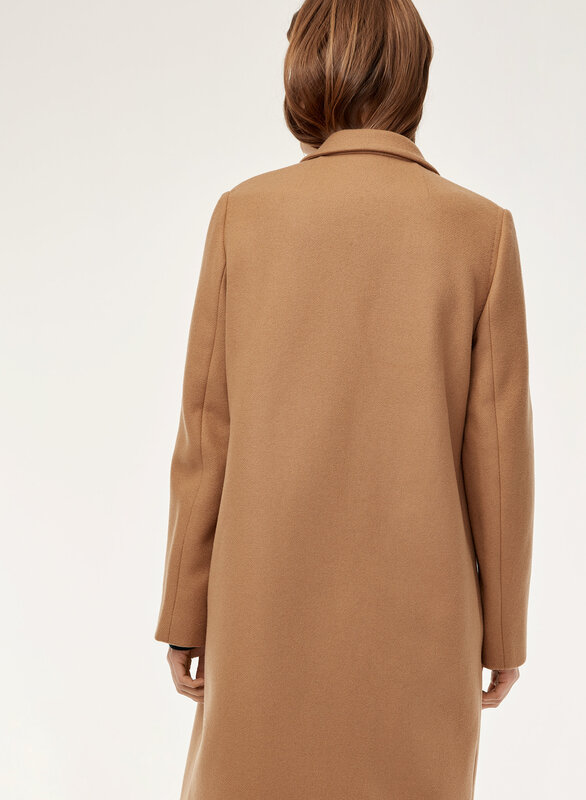 Love this coat - it is timeless, classic, and goes with everything from work-wear to jeans. It fits slightly larger. I am usually a S to M, but bought a S and still have room for a bulky sweater. I love that there is no lining. I tried on a few lined coats but they felt stiff, especially around the arm/shoulder. It is the perfect weight for me - not too hot, not too cold. I'm actually thinking about buying a second one in a different colour! This coat is a bit roomier than what I expected but if I wore a hoodie or thicker sweater with it, it fits great. It's unlined and a bit thinner but still looks great! It can be dressed down with jeans and a simple tee or dressed up to be worn to the office. I love the Stedman coat! It is so high quality and looks so luxe with your outfits. 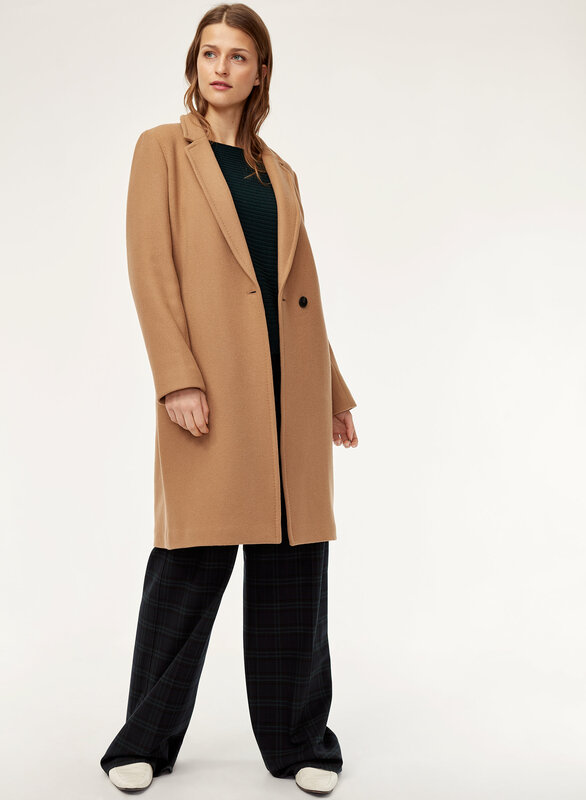 I will say that it is not warm enough to wear in the colder winter months like Jan/Feb (in NY) but it would serve as a great fall and early winter coat and looks amazing with pretty much anything! Love it so much! Absolutely beautiful coat! I’ve been eying it for a long time and finally purchased it. I usually get a S but due to the oversized fit I had to go down to an XS. This is a staple piece for any wardrobe!!! Love the coat! Would love if it came in a merino wool blend so it’s easier to dress down. Overall pretty happy with this coat. Fit is a bit oversized so although I would usually wear a L in coats/jackets, I sized down to an M (and still have room!) Definitely not made for the dead of winter it Toronto but does well for fall/spring wear. Lining throughout the coat (and not just the sleeves) would do this piece wonders for warmth and overall quality. This is my main reason for the 4 star review as it makes it seem a bit cheap. Finally a coat that fits petite shoulders.